Oh, i cant wait, I will love also to be able to say to the wallpaprfusion api to load only 1, 2 or 3 displays wallpaper option and also with a tag (ei nature, games, etc) and also with the highes score like 3 stars and up. I ahve 3 PCs in which I use DF, one with 2 displays and a laptopt and anotehr PC with one display and I will love to have all using Wallpaperfusion to load diferent criteria wallpapers. @Alejandro: Full DisplayFusion integration is coming very soon, stay tuned! This is super cool. Any ideas on pricing, or will it just be a differentiator for the software? 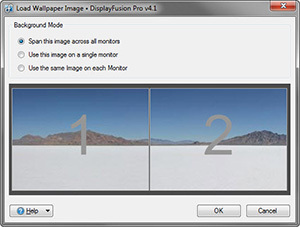 @Jason: WallpaperFusion is free and will only be integrated into DisplayFusion.